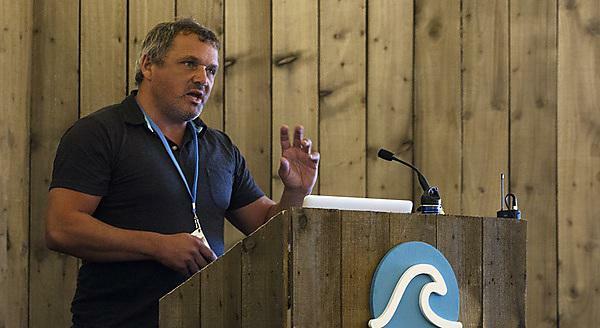 A Plymouth University academic has received a prestigious accolade in recognition of his global efforts to promote sustainability in the surfing industry. Dr Gregory Borne, Director of the Plymouth Sustainability and Surfing Research Group, has been awarded the title of Conrad N Hilton Distinguished Lecturer from San Diego State University. The accolade was awarded to Dr Borne and Senator Fred Hemmings who both delivered key note speeches at the Sustainable Stoke Conference, hosted by San Diego State University’s Center for Surf Research in September this year. This is the latest success for Dr Borne and his research group in 2015. In May, he released Sustainable Stoke – Transitions to Sustainability in the Surfing World, a book which he co-edited and which explores the challenges to be faced in making surfing sustainable. Then in July, he was among those invited to address HRH The Prince of Wales as part of an Ocean Plastics Awareness Day organised by Surfers Against Sewage, the Marine Conservation Society and Clean Cornwall. And in October, he was among the keynote speakers at the first Global Wave Conference organised by Surfers Against Sewage (SAS), which brought together some of the world’s leading authorities on the marine environment and sustainability. The Hilton Distinguished Lecturer Series is an endowed programme of San Diego State University’s School of Hospitality and Tourism Management that brings world class speakers and industry leaders to San Diego to enlighten not only students of the school but the broader community as well. Inviting Dr Borne and Senator Hemmings to speak about surfing and sustainability is something of a departure from previous speakers who have included CEOs of major corporations including McDonalds, Burger King, Royal Caribbean Cruises, and Starwood Hotels. Take the opportunity to discover emerging debates around sustainable development and how these apply to the surfing world, in this contemporary module.